I’ve had senior moments before: walking into a room and forgetting what I came for, leaving stuff at home I’d meant to take with me, etc., but it seems like lately it happens more. Maybe it’s because I have too much stuff happening during the day that’s filling up my brain and making me forgetful – I don’t know. It’s super annoying though. As I’ve told you in previous blogs, Sean and I are in the habit of trying to make big, one pot meals that we can get 2-3 servings out of at least, so that we have food to take to work for lunch and we don’t have to cook every night of the week. It would be one thing if one of us worked from home or didn’t work outside of the house, but since we’re both out all day, by the time we get home and decompress, cooking isn’t always at the top of the list of things we want to do. Last week, Sean was really yearning for another pasta dish similar to one I’d made a few weeks before and when he suggested baked ziti, I said, “Ok,” and we set to devising our own recipe for it. Typical zit is made with ground beef or Italian sausage and loads of cheese. While that stuff is great, it’s not exactly healthy, so I tweaked a few things: leaner ground beef (or ground turkey if you prefer), non-fat Greek yogurt substituted for sour cream and just a little less cheese than normal. Even with these switches though, this healthy baked ziti tasted great. We definitely think it’s a winner and I think you will too! Preheat the oven to 350 degrees Fahrneheit. Spray a 9×13 inch baking dish with non-stick cooking spray. 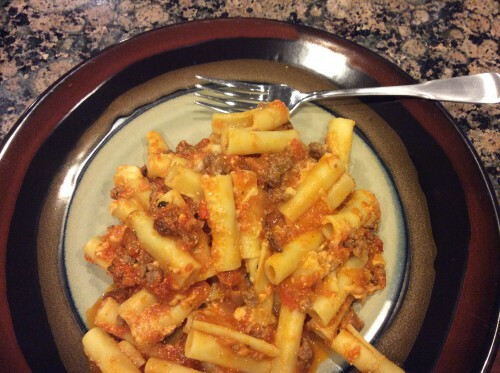 Bring a pot of water to a boil and prepare the ziti according to package directions, however, remove the ziti when it is just done (it will be finished completely baking in the oven). Drain and set aside. Chop up the yellow onion. Heat up the olive oil in a large skillet over medium heat. Add the chopped onion and cook it for 3 – 4 minutes until it’s translucent then add the ground beef, paprika, Italian seasoning and crushed red pepper flakes. Cook until the beef is cooked through. Put the two cans of pasta sauce into the skillet with the beef and onion, and simmer for 15 minutes. Turn off the heat after the skillet’s contents have simmered for 15 minutes and add the two containers of Greek yogurt. Stir to combine. In the baking dish, layer half the ziti pasta, all the provolone cheese, half of the sauce and meat mixture, the rest of the ziti, 3/4 of the mozzarella cheese, the rest of the meat mixture and sprinkle the top with the remaining mozzarella cheese. 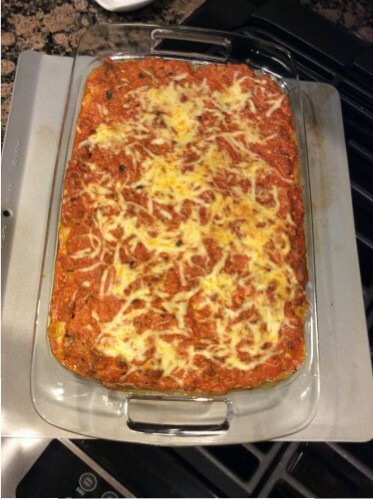 Behold the ziti fresh out of the oven! Doesn’t that look great? And it’s so filling too.